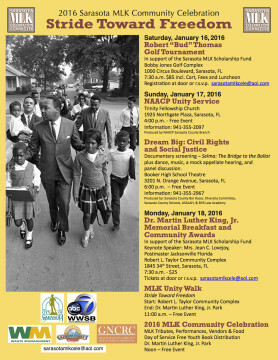 As part of Stride Toward Freedom, the 2016 Sarasota Martin Luther King Jr. Community Celebration honoring the life and work of the civil rights leader, Booker High School will present Dream Big: Civil Rights and Social Justice from 6 to 8 p.m. on Sunday, Jan. 17, in the school’s Visual and Performing Arts Theatre (VPA), the Sarasota County School District has announced. “The program, an evening of oratory, investigation and the arts, is sponsored by the Booker High School Law Academy, Sarasota County Schools, the Sarasota County Bar Association Diversity Committee, and Association for the Study of African-American Life and History,” a news release says. “The event will begin with a showing of the documentary Selma: The Bridge to the Ballot, which chronicles the famous marches of 1965 through newsreel footage and interviews,” the release continues. The film, produced by Teaching Tolerance (an arm of the Southern Poverty Law Center), “is an inspiring look at bravery in the face of racism and brutality,” the release adds. Also featured during the evening will be an interpretive dance performance by the Booker High School VPA Dance Department, the release points out. “Courtney Smith and her students have created a new piece for the event, interpreting themes of discrimination, acceptance and overcoming adversity,” the release says. “Utilizing a popular song by Marvin Gaye, the piece highlights the juxtaposition of violence and passive protest, opposition and resilience, and hatred and love,” the release explains. “Connecting our past with our present, the gestures and relationships of the dancers [will] urge us to learn from history,” the release adds. Additionally, Booker High School Law Academy students have planned a mock civil rights appellate hearing, scripted by Chief Judge Charles Williams of the Sarasota County Bar Association Diversity Committee, the release notes. “Students will act out a fictitious but representative legal case about the integration of the beaches here in Sarasota,” the release explains, adding that Williams based his case on events reported in local news articles at that time. The program also will feature a panel of past and present civil rights and social justice activists: Jetson Grimes, local business owner and community activist for the past four decades; Gail Foreman, a Booker High School Law Academy teacher; and Edward James III, who is running for the District 72 seat in the Florida House of Representatives, the release says. Booker High School Law students will introduce the panelists and moderate the discussion. To conclude the program, winners of the Sarasota County Schools MLK Essay Contest will be announced, the release notes. The first prize is $1,000 ($500 to the student; $500 to school); second prize is $250; and third prize is $100. The overall winner will also present his or her essay to the audience, the release adds. Booker High School and the VPA Theatre are located at 3201 N. Orange Ave. in Sarasota.